WASHINGTON (Reuters) - A man threw firecrackers over the White House's north fence line on Monday, just hours after a deadly shooting rampage in the U.S. capital in which 13 people died, the U.S. Secret Service said. Uniformed agents sealed off the area in front of the presidential mansion and ordered journalists in the driveway in front of the West Wing to move inside the building. With the capital on high alert after the earlier shootings, reaction to the firecrackers was immediate, with some people tweeting that shots had been heard. "There have not been shots outside the White House," said Secret Service spokesman Ed Donovan. Video footage of the incident showed agents apprehending a man dressed in shorts and a short-sleeve shirt before leading him away. 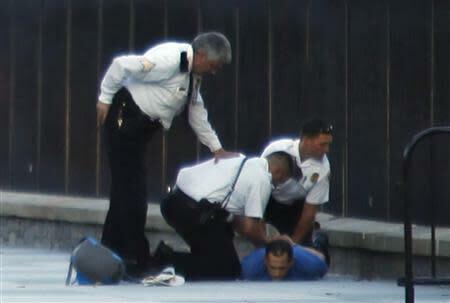 The man had been arrested and was being processed, a second spokesman for the Secret Service said.